I recently purchased a Cabela’s Variety Pack of jerky seasonings. I used the original seasonings in a prior post. For this project, I used the Peppered Jerky seasonings. I started by taking 5 pounds of the moose and thawing it to a point it was still firm but I could cut it with my ham slicer. I sliced the meat to about 1/8 inch thick which is easier while it is partially frozen. 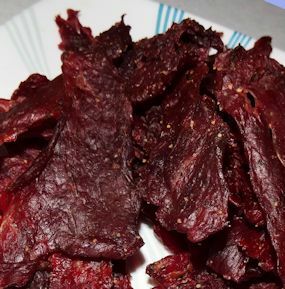 I then cut the slices to the size I wanted for my jerky. I mixed the Cabela’s cure and seasoning package with 1/2 cup of cold water. The slurry is poured over the meat. Mix the meat and slurry thoroughly. When you think you have mixed it enough, mix it some more. If your hand is as cold as your wife’s stare when you talk about your mother in law, you haven’t stirred it enough. Cover the meat and refrigerate it overnight. 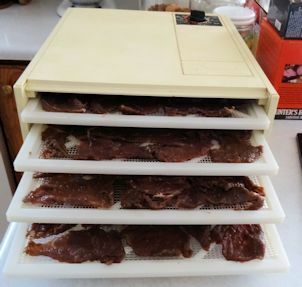 The next morning, I put the first batch of moose into my dehydrator set at 180 F. You can put it in an oven set at 180 F but an oven will take longer as there is no fan forcing the moisture out. I took the meat out after an hour and put it in my Bradley Smoker for an hour at a temperature of 180 F with hickory smoke. This is optional but I like some smoke flavour on my jerky. When the meat is dry and pliable, take it off. I can not tell you how long this will be. It depends on how thick the meat is, the efficiency of your dehydrator and the density of the meat. I took me about 4 hours a batch. This part is very important. You need to hang around and watch your jerky so you can’t do other projects or chores. Also, it is dry work and you need to keep hydrated. I find beer works best. This is the story I told She Who Must Be Obeyed and I am sticking to it. First, I’ll speak to the seasoning mix from Cabela’s. As soon as I bit into this I thought of pepperoni. There is a nice seasoning blend with a real pepper bite. If you like hot pepperoni sticks, you’ll like this seasoning blend. If you don’t like some heat, this isn’t for you. This means I will like it and She Who Must Be Obeyed will leave it for me. 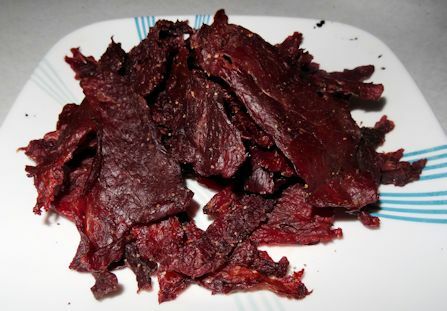 Second, I will address making jerky from Moose. The moose meat is very lean and has a deep meaty flavour. This makes for a great textured jerky with a wonderful taste. I will give half to my benefactor. I don’t want to but it is the least I can do for the generosity of a friend. I’m going to have to try this someday, although I don’t know anybody that will give me some moose meat. Thanks for another great one. The spices would be very good with beef or turkey thigh as well!